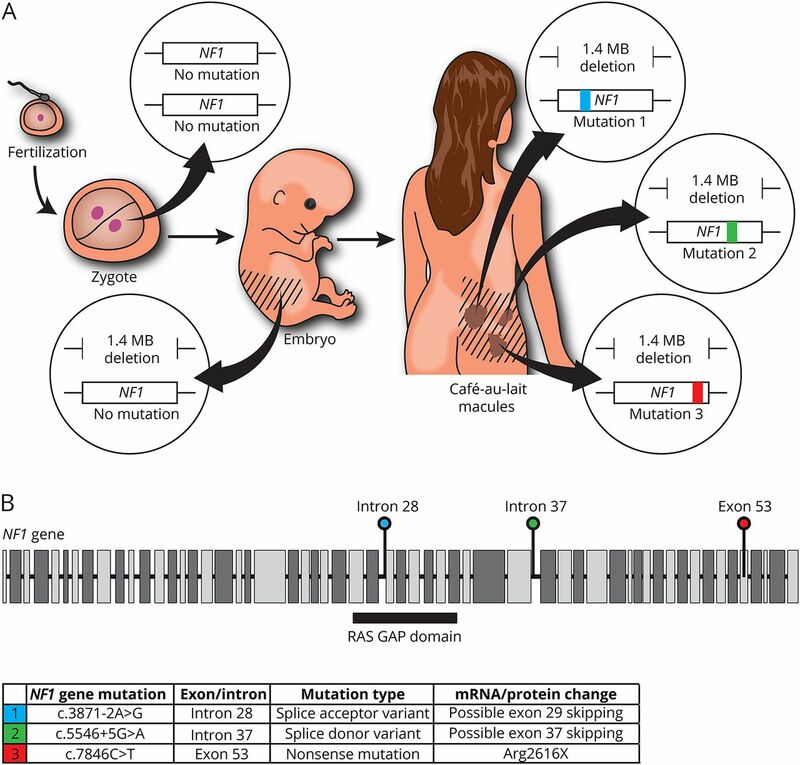 (A) Segmental or mosaic NF1 is caused by de novo NF1 gene mutations that occur during postzygotic development and affect only a subset of cells in the body. Genetic testing of melanocytes derived from three different CALMs in the patient's affected body segment (denoted by the diagonal stripes) revealed a common 1.4 megabase (MB) deletion, resulting in total loss of one copy of the NF1 gene, and three unique second-hit mutations affecting the remaining NF1 allele. The insets depict both NF1 gene copies in the indicated cell types. (B) Locations (colored pinheads) and predicted messenger RNA (mRNA) and protein changes resulting from the second NF1 gene mutations in melanocytes derived from three different CALMs. Two intronic mutations were located within splice sites, and one exonic mutation resulted in a premature stop codon (nonsense mutation). Short black boxes denote introns; tall gray boxes denote exons.